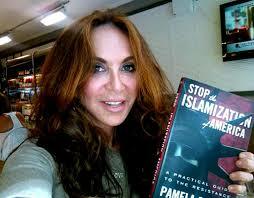 Pam Geller has now faced two highly-publicized Islamic terror threats this year. Facebook has immense power over organic media — the sharing of our info between friends. The idea that some snotty, ivy league brat wields breathtaking power over how much we can or cannot share with our personal communities is frightening. 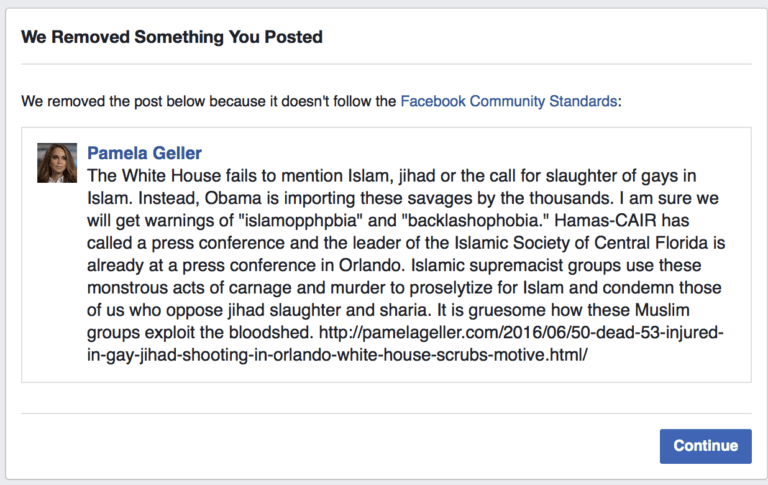 Geller’s 50,000-strong Facebook group, “Stop Islamization Of America” was removed from Facebook earlier today, despite being active for over five years, due to allegedly “hateful content.” A few hours later, her own Facebook account received a 30-day ban after she made a post criticizing President Obama for his response to the Orlando shootings. The timing of Facebook’s sudden burst of censorship – just a day after the Muslim terrorist Omar Mateen carried out the deadliest terror attack on U.S. soil since 9/11 – is hard to ignore. It also casts doubt on the social network’s claims to political neutrality, which the company repeatedly pushed during last month’s “Trending News” scandal. AB: Facebook say they took down your page because of their rule against “hateful, obscene, or threatening” content. What’s your response? PG: It is not hateful, obscene, or threatening to oppose jihad terror such as we saw in Orlando last night. Truth is not hateful or obscene. What is hateful, obscene and threatening is that Facebook is moving to silence everyone who speaks honestly about the motivating ideology behind such attacks. AB: Why do you think they took the page down now, of all times? PG: They are in full damage control mode. Orlando showed jihad for what it is. They’re committed to obscuring that knowledge and making sure people remain ignorant and complacent about the nature and magnitude of the jihad threat. ITS TIME – We build an emgerency back-up plan, a network that will still get out the word of truth in the event for a emergency. They have already shown their hand here !!! !